This work focuses on the Hindu deity Ganesha. Ganesha is the remover of obstacles and is identified by his elephant head. 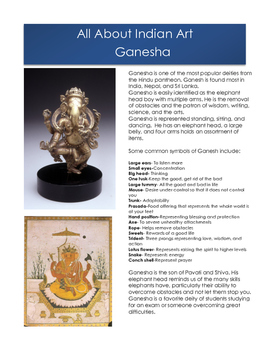 This resource explains what some of the features and common objects associated with Ganesha mean. Help clarify Hinduism with this easy to understand explanation for the symbols of Ganesha. Visual Arts Class- Use this as a jumping off point for an Indial art lesson.